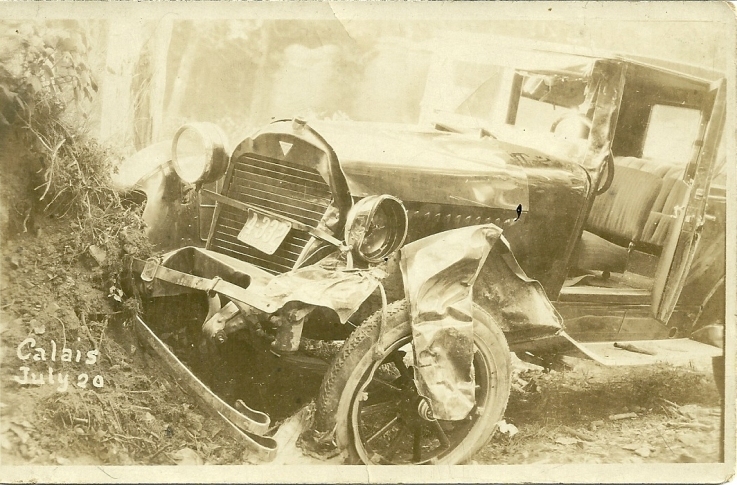 Vintage snapshot of the aftermath of an accident at Calais, Maine, on July 20, year unknown, involving a Hudson Motor Car owned by a Mr. Sullivan of Lubec, Maine. Hudson Motor Cars were in production from 1909 until 1957. The company was founded by Detroit department store owner J. L. Hudson. In 1929, the peak year of production, some 300,000 Hudson and Essex cars were built. Hudson merged with Nash Motors in 1954, creating American Motors. As for the auto's owner, Mr. Sullivan from Lubec, Maine, I found too many possibilities, some of them brothers perhaps: James F. Sullivan; Frank Sullivan; Harold Sullivan; Thomas Sullivan; Warren Sullivan; Gordon Sullivan; Gardner Sullivan. Then again, perhaps the Mr. Sullivan we seek was none of them, but someone else entirely. If you have any insights into the Hudson Motor Car owned by a Mr. Sullivan of Lubec, Maine, please leave a comment or contact me directly. Thanks!